Super Bowl LIII is approaching and, much like the heat death of the universe, it’s inevitable that the New England Patriots would be involved. In a rematch of Super Bowl XXXVI, the Patriots are taking on the Los Angeles Rams, much to the surprise of all three Los Angeles Rams fans. Since you want an excuse to drink on a Sunday night, you’re more than likely hosting or attending a Super Bowl party. If so, and since the Patriots bandwagon has gained more steam in the last two decades than Pumpkin Spice Lattes, you’re likely to encounter an obnoxious Patriots fan who probably forgot Bill Belichick used to coach the Cleveland Browns and can’t name one Patriots player from before 2018 other than Tom Brady. 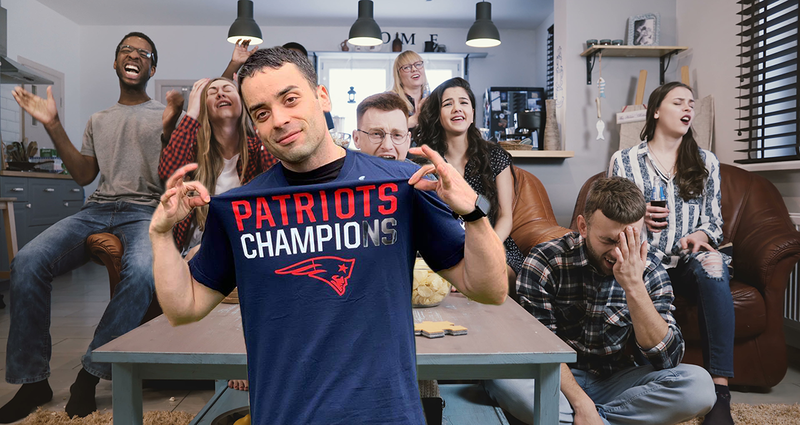 However, The Peedmont is here to help with our Guide to Dealing With the Patriots Fan at Your Superbowl Party Who Won’t Shut the Hell Up. Option 3: Pay More Attention to the Commercials and Halftime Show. Alcohol is scientifically proven to make everything better, before making everything much, much worse. However, there’s a bright side—the more you drink, the less you care that your Patriots fan friend has spent the last hour ranting about Deflategate. Even better, the earlier your party starts, the more likely that Patriots fan you invited against all good sense won’t make it to the National Anthem, since he’ll be 12 beers in by 6 p.m. Get him a 24-pack of Sam Adams and wait until later to serve the food, so the rest of your friends can enjoy some peace and quiet. So you’ve made it this far, why not visit our online store?